Dimapur, July 14 (MExN): The 204th Bhanu Jayanti, the birth anniversary of poet Bhanu Bhakta Acharya, was celebrated at Chumukedima Town Hall on July 13. Acharya is popularly known as ‘Adikabi’ and remembered for his great contributions to Nepali literature, stated a press release received here. The poet has many literary works to his credit, including translation of the epic Ramayana from Sanskrit to Nepali, and was the “first poet ably united all through Nepali language,” it added. Presided over by BB Sewa, president of Chumukedima Gorkha Union, the commemoration event was graced by the chairman, State Co-operative Marketing & Consumers’ Federation Ltd (MARCOFED), Dr. M Chuba Ao as the speaker. 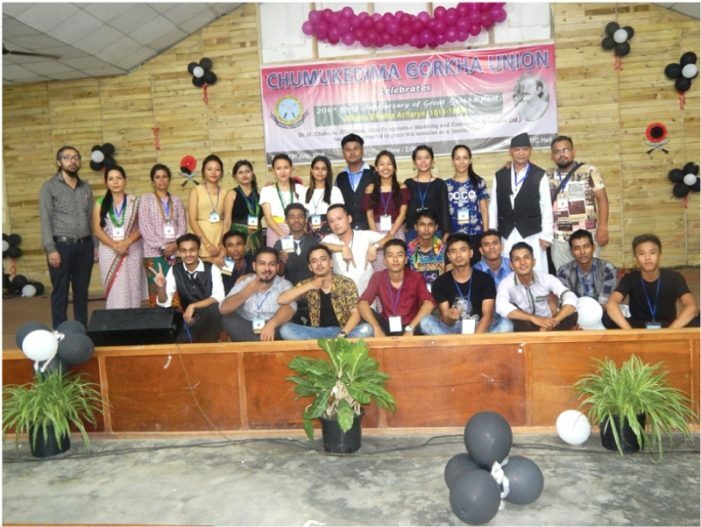 The programme, according to the release, was a vibrant blend of the cultural grandeur of Chümoukedima which included recitations of poetry, cultural songs, dances, and band performances by various artists of the Gorkhas of Chümoukedima. The formal session was followed by Cultural Extravaganza organized by the Chumukedima Gorkha Youth. The Chronicles Band, the only Gorkha band of Dimapur, was the guest band there. The release informed that chairman of MACROFED, Dr. M Chuba Ao in his address expressed delight at the renewed energy and vigor with which Bhanu Jayanti is celebrated in Chümoukedima every year. The contribution of Bhanu Bhakta Acharya, he stated, is one of the most momentous contributions to language and society and that his sense of responsibility towards the society shall always be engraved in history. Culture and heritage have always been of prime importance to look towards an able and successful society, he added. BB Sewa, president of Chumukedima Gorkha Union meanwhile congratulated all the awardees and requested all the students and the youth present to “be the pilot of their own lives” and steer themselves to success in life. He proclaimed that the “Unity in Diversity” is the strength of Chümoukedima and this cultural principle should always be maintained and followed. At the event, HSLC, HSSLC & Graduation level students were felicitated with meritorious award for their outstanding performances in their studies. The programme ended with awards given for various competitions and performance by The Chronicles Band. More than 400 Gorkha community members were present to observe the celebration, it was informed.